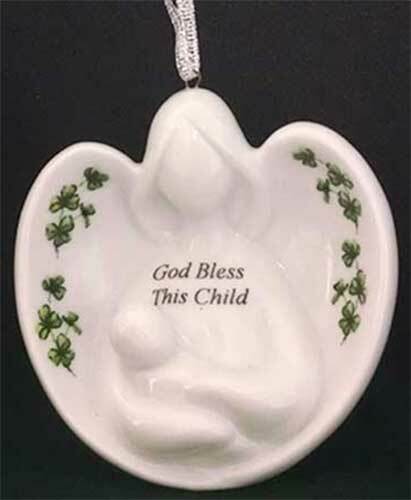 This Irish ornament features the following blessing: God Bless This Child. The Irish angel depicted on this white porcelain ornament is cradling a baby and it is enhanced with a blessing along with shamrocks. The Irish baby blessing ornament measures 3 1/8" wide x 3 1/4" tall x 1 1/2" deep; it may stand on a flat surface or you may hang it on your Christmas tree with the included white ribbon. You may also illuminate this Irish ornament by inserting a bulb in the base opening.